Pirelli World Challenge’s rad cheap hatchback B-spec class, TCB, officially fizzled out this year. I thought I would be at a loss for good small car action this weekend, but no! TCR is here, complete with unobtanium hatchbacks we don’t get as road cars in the United States, and it is my new race car best friend. Admittedly, TCR is further out of reach than B-Spec was. B-spec’s focus was on being extremely budget friendly, with all the parts needed to transform your normal Mazda2, Honda Fit or likewise tiny car coming in a reasonably priced kit. You could get the parts for one for under $25,000 and even build it yourself if you didn’t feel like shelling out for shop labor. They’re still racing B-Spec cars at the club level for obvious reasons. A PWC B-Spec Mazda2 from 2013. As new cars become more complicated, chasing down the gremlins when you replace or take off different items that are required or nice to have on the road can become pretty tedious. Some of those will send the car into limp mode, make it harder to drive or render it unusable, and it’s become much harder to work around programmed-in street-car tech. Anyone who’s ever fought a traction control system surprise-coming-on during a track or autocross event knows the pain of which I speak. 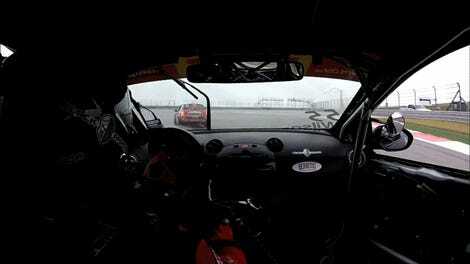 Road car traction control is designed to keep the car from sliding, yet race and track cars slide around a bit by default as you push the limits of a car. Safety systems in particular are set up to fight the way you drive on track, which can be much less safe when the car keeps applying the brakes to stop your car from sliding and roasts your brake pads accordingly. 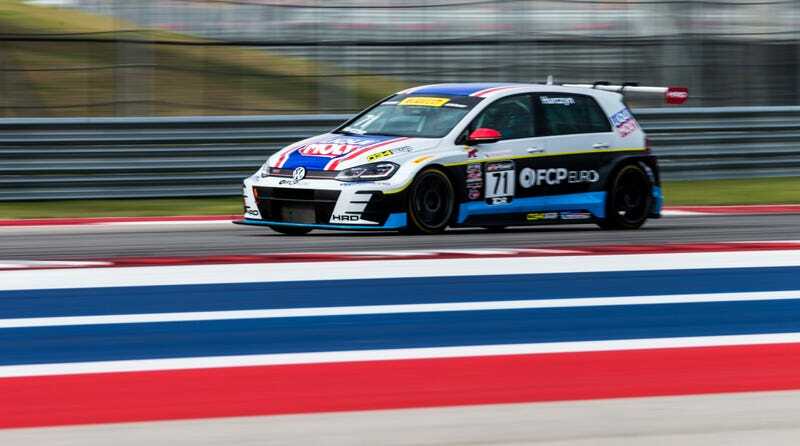 A Volkswagen Golf GTI TCR at Circuit of the Americas this weekend. Weeding out these programmed-in gremlins so they don’t ruin your race eats up a lot more shop time than it used to. That’s where the new TCR spec comes in. You order a race car, and it shows up nearly ready to race, sans any series-specific kit you may want to add. This is what the FCP Euro by HRD team did: they called up Volkswagen’s TCR contact for North America, and ordered a car. The whole car cost around $130,000, about $9,000 of which was in shipping and $10,000 was in taxes and duties, according to FCP Euro driver Nate Vincent. What comes with that price, though, is a lot more than you’d get from a B-spec parts kit. Each manufacturer earmarks a certain number of TCR cars for racing in each of their main markets and prioritizes who gets cars first. In the United States, the IMSA series’ TCR cars arrived first since their first race was in January. When theirs was ready, FCP Euro’s nearly complete Volkswagen Golf GTI TCR race car flew over from Europe in one day. It arrived and had to go through customs with a body in white, sitting with a tag hanging from its rear-view mirror. “It looked like a rental car,” Vincent told Jalopnik. If only rental cars came with those fender flares. Two Golf GTI TCRs on the grid next to a TC-class Subaru BRZ tS. Vincent said his team only had to add a few things, like the radio, a meatier center-net and PWC’s series-mandated Motec data system, but otherwise, the car could hit the track—as is—fresh off the plane. A full factory service manual came with it, complete with instructions on a good set-up to start with that’s easy to drive. They’ve since dropped two seconds a lap by setting up their car more aggressively, and allowing the car to be a bit more tail-happy. These little front-wheel-drive Golfs, i30s and the like get delightfully slidey out on track, just like the much simpler B-Spec cars did. Much of the car is even shared with the roadgoing GTI, like the headlamps, throttle pedal and rear brake rotors. Others are pretty normal racing parts, like the Aim dashboard and Momo driver’s seat. There are a few TCR-specific parts, though, like the plastic door panels that have channels in them to accomodate the roll cage, and of course, that beautiful aero kit. Still, Vincent said that the parts aren’t that much more expensive than the Mazda MX-5 Cup cars that are also running this weekend, yet TCR comes with full aero, allowing them to nail down lap times that are just two seconds off of the lap times of full-on GT4 cars. Vincent said that the most expensive parts to replace are probably those cool boxy carbon fiber fenders. Volkswagen and TCR manufacturers like it bring a full contingent of spare parts to a race in case something happens, and even offer help getting things swapped out and fixed at the track. Even then, TCR parts are designed to be as easy as possible for small teams to use. The dampers, for example, only have two-way adjustments for compression and rebound. The brake calipers are meant to be the same from right to left, and include mounting points for both sides just in case you’ve got one on hand quick. The Golf GTI TCR with its front end off. Funnily enough, the Audi RS3 TCR has slightly nicer finishes inside than the Volkswagen cars, like its $12,000 drivers’ seat as opposed to the $1,100 Momo in the VW. It’s just like VW and Audi are on the road! This is the first weekend for the TCR class in Pirelli World Challenge, so they’re still figuring out how to balance out all the different cars there. The Hyundais, which come with full sequential racing transmissions as opposed to the more road-car-like dual-clutch transmissions in the Volkswagens, breezed through to a 1-2 finish just a little too easily—though I don’t think that will be the case next time. As a person who enjoys watching little cars get tossed around on track, I like where TCR is headed. The series will figure out how to make the different cars run closer to each other soon enough as they can slow down the faster cars by adding weight and other things. Even now, I see tiny regular cars getting thrown around on track again, and all is right with the world. The Alfa TCR is one of the prettiest cars here, too. Bonus: Pirelli World Challenge’s TCR class is probably the only time I’ll ever see an Alfa Romeo Giulietta or Hyundai i30 roaming around Austin unless someone drives one up from Mexico. Since it doesn’t have to be a road legal car to race, these international racing specs like TCR are open to all kinds of cool stuff we don’t get. I also now have the insatiable dumb need to throw big box flares onto a Mitsubishi Mirage. Don’t judge me. Honda’s TCR car is based on the Civic Type R, so it’s a little bigger than the old B-Spec Fits, but I can’t say that I mind watching these race at all. Ever see a Hyundai i30 in the U.S.? Now you have.